For release in the Advances in Wireless Technologies and Telecommunication (AWTT) Book Series. The Advances in Wireless Technologies and Telecommunication Book Series aims to provide researchers and academic communities with quality research on the concepts and developments in the wireless technology fields. Developers, engineers, students, research strategists, and IT managers will find this series useful to gain insight into next generation wireless technologies and telecommunication. Mobile technologies have made a tremendous impact on our daily lives. They will continue to bring changes in the way we communicate with others in the years to come. These technologies have given rise to increasing expectation to be responsive among individuals, developers and businesses to fast changing lifestyle needs especially when using mobile as the main platform. Notably, issues surrounding mobile computing and technologies will continue to prevail. These include security and mobile use among groups with special needs. This handbook aims at providing insights into social, behavioral and technical aspects surrounding mobile computing. It will discuss recent research findings on mobile technologies from social, behavioral and technical perspectives of users, developers, designers, businesses and groups with special needs. The book aims at aiding future research and providing recommendations and guidelines for practice in mobile computing, mobile technology use, mobile application development and mobile technology security. Researchers, instructors in mobile computing, practitioners, mobile application developers, IT security officer, directors and managers leading IT function. Researchers and practitioners are invited to submit on or before March 15, 2014, a 2-3 page chapter proposal that clearly explains the mission, concerns, topic and structure of the proposed chapter. Proposal should include authors’ names, affiliations and email addresses. Submissions should be made through the link at the bottom of this page. Authors of accepted proposals will be notified by March 30, 2014 about the status of their proposals and chapter guidelines will be sent accordingly. Full chapters are expected to be submitted by July 15, 2014. All submitted chapters will be reviewed on a double-blind review basis. Contributors may also be requested to serve as reviewers for this project. Celebrating over two decades of Gender Research and of the joint Nordic Journal of Feminist and Gender Research, NORA, the journal invites gender and feminist researchers to participate in the first Nordic Conference for Gender Research: NORA conference 2014. Papers are invited in the context of the following six thematic streams around which the conference is organized. We encourage all participants to consider untraditional ways and formats when presenting and sharing their work. While the ALA is not the only national library association to articulate their core values, 2014 marks the ten-year anniversary of the ALA’s adoption of this statement. Such an anniversary offers us a useful opportunity to consider how core values have shaped, influenced, and informed libraries and librarianship in North America and around the world. Individual values such as democracy, diversity, access, and social responsibility have been the subject of inquiry by prominent scholars in library studies. There has not, however, been a coherent collection of scholarship addressing these specific, individual values in the practice of librarianship. Valuing Librarianship, a special issue of Library Trends, is an attempt to redress this absence within the context of public, school, special, and academic libraries. This proposed issue of Library Trends will invite practicing librarians and LIS scholars to address librarianship’s present and future in relation to its core values. Using the ALA Core Values of Librarianship statement as a framework, Valuing Librarianship will explore how these core values have informed, influenced, guided, and contextualized libraries and librarianship in the past ten years and consider how these values might guide our profession in the future. How has this value evolved over the last ten years? How do librarians enact and advocate for this particular core value? Are librarians successful in their advocacy? Where does this particular value emerge in librarianship or libraries? Is attention to this value changing libraries, the work we do in the profession, or the profession itself? Other questions that look specifically at how one core value reflects, informs, guides, or challenges current practices and thought within libraries or librarianship. Values are a key building block of one’s professional identity and librarians must define, describe, and enact these values daily. This special issue of Library Trends will work toward articulating these values in meaningful ways in order to build upon the foundations of librarianship and shape it for the future. A list of author’s/authors’ selected and relevant publications and presentations with links as available. this vast new world of information literacy. Call for Proposals now through March 7, 2014! institutions are highly encouraged to submit a proposal. jhansen@mxcc.edu by March 7, 2014. Presenters will be notified of proposal acceptance by March 21, 2014. We are pleased to invite you to participate International Conference on Advanced Technology &Sciences (ICAT’14) which will be held in Antalya, TURKEY, 12-15 August, 2014. Thank you for your interest for participating ICAT 2014 and we look forward to meeting you in 5 stars Harrington Park Resort Hotel (all inclusive service) in historical city ANTALYA which is surrounded by green and blue. Additionally, the participants may choose to attend the post-conference tours to various magnificent historical and natural beauties of Antalya. Thus, ICAT’14 will let you not only have a good summer holiday but also participation to an international conference. We guaranty that you will have unforgettable memories after this journey. The ICAT’14 conference organized by Selcuk University is designed to bring together leading international and interdisciplinary research communities, developers, and users of advanced technologies and to discuss theoretical and practical issues in all the field of technologies. All topics and all the scientific/technological approaches in the various advanced technological fields are pertinent to this Symposium. The Scientific committee members are composed of international experts in various disciplines. The technical program will consist of keynote speakers by eminent specialists, oral presentation of the contributed papers and posters of the work-in-progress. All the accepted papers will be published in the journals listed on the conference web site. Please forward this e-mail to your colleagues and potential authors who might be interested in. Please consult http://conference.atscience.org for more information. For release in the Advances in Systems Analysis, Software Engineering, and High Performance Computing (ASASEHPC) Book Series. The Advances in Systems Analysis, Software Engineering, and High Performance Computing (ASASEHPC) Book Series brings together research in the areas of distributed computing, systems and software engineering, high performance computing, and service science. This collection of publications is useful for academics, researchers, and practitioners seeking the latest practices and knowledge in this field. Business activities are rapidly changing nowadays and there are increasingly complex requirements set on programming solutions, which put traditional software development methods, also called heavyweight, behind and lead to new modern approaches sometimes called lightweight. The market volatility of the past year has highlighted in sometimes painful fashion the need for companies to anticipate and address pivotal events that affect their business. Planning for the unpredictable may seem an impossible irony, but many firms appear to recognise that in a period of turbulence, an organisation’s ability to respond is critical for sustaining growth. � To promote awareness of Software engineering methodologies. � How Software Engineering helps for Performance Enhancement and Appraisal. This edited book will focus on real world applications; therefore authors should highlight the benefits of Information Technology for industry and services. Ideas on how to analyze system will arise from the book. The purpose of the Edited Book is to bring together researchers, students, engineers and practitioners interested in the advances of organisation’s agility. Researchers and practitioners are invited to submit on or before March 15, 2014 a 2-3 page chapter proposal clearly explaining the mission and concerns of his or her proposed chapter. Submissions should be made through the link at the bottom of this page. Authors of accepted proposals will be notified by April 30, 2014 about the status of their proposals and sent chapter guidelines. Full chapters are expected to be submitted by July 15, 2014. All submitted chapters will be reviewed on a double-blind review basis. Contributors may also be requested to serve as reviewers for this project. This book is scheduled to be published by IGI Global (formerly Idea Group Inc.), publisher of the Information Science Reference (formerly Idea Group Reference), Medical Information Science Reference, Business Science Reference, and Engineering Science Reference imprints. For additional information regarding the publisher, please visit www.igi-global.com. This book is anticipated to be released in 2014. The second annual review looks at how we access, store and preserve our cultural heritage. The University of South Carolina, School of Library and Information Science and Rowman & Littlefield Publishing Group/AltaMira Press with Charles Harmon, Executive Editor publishes an annual compilation of research, technologies, and a review of literature in the fields of Cultural Heritage, Imaging for Museums and Libraries, Digital Humanities, User Behavior and Best Practices in the field. International contributions are welcome. An editorial board formed from scholars in the field, researchers and museum professionals with previous work in the field of cultural heritage and informatics assists with reviewing and editing manuscripts. The publication of a second Annual Review in this nascent and growing field is an important contribution to our scholarly knowledge and we welcome you to continue to help us build for the future. The target audience for the Annual Review includes undergraduate or graduate students, scholars, and professionals. Please submit a Letter of Intent with a brief description of your work by March 10, 2014 to hastings@sc.edu. The editorial board will notify you with an invitation to submit by March 15. Manuscripts will be due May 15 for publication in the 2014 edition. Author guidelines will be sent after the letters of intent are received. 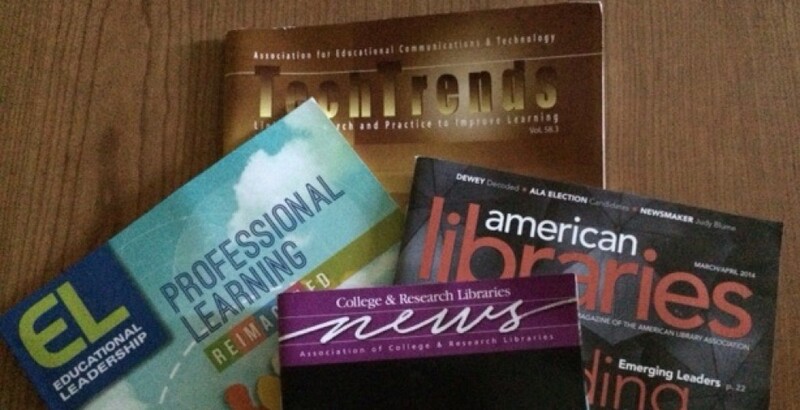 ACRL/DVC is planning a program on libraries and online learning. With the changing nature of higher education, the focus on MOOCs, expanding online programs, as well as hybrid courses, libraries have continued to work towards enhancing the library experience, both in-person and online. Have you provided research support to students in online courses? Worked with faculty who teach online? How has your library tried to integrate more library resources into courses using online components? Have you developed online programs to support information literacy or lifelong learning? How has your library expanded services by leveraging online technologies? Have you developed any assessment or user experience strategies to determine effectiveness of online learning as it relates to library services? If you were or are involved in any online, library-related services, consider sharing your experience and thoughts with other academic librarians. We invite you to submit proposals on any aspect of online learning and librarianship. A committee of ACRL/DVC board members will select the final presentations; this is an opportunity to add a peer-reviewed presentation to your CV! The program will be on Wednesday, April 30 at the Penn State Great Valley campus in Malvern. All presentation slots will be 20 minutes long followed by a short period for questions and answers. To submit a proposal, simply send an email with a presentation title and description (300 words maximum) to Tina Hertel [tina.hertel@muhlenberg.edu] by March 25 at 5:00 pm. Please contact Tina if you need further information. The deadline to submit to the Northeast Chapter’s Spring Workshop has been extended to Monday, March 10. The Spring Workshop will be held on Friday, June 13that The University of Scranton in Scranton, PA. The theme for this year’s workshop is “The Changing Face of Libraries” and we are currently seeking proposals from academic, public, special librarians, and consultants from across Pennsylvania that are interested in presenting. If you are interested in presenting on one of the above topics or another topic related to “The Changing Face of Libraries,” then please consider submitting your proposal through the online Google Form:http://j.mp/NePaLA2014CFP. Deadline for submission is March 10, 2014. We will be seeking approximately six presenters for 60 minute presentations and approximately eight presenters for 7 minute Pecha Kucha presentations (http://www.pechakucha.org/faq). If you wish to be considered for both types of presentations, please indicate that on the form. All proposals received by March 10, 2014 will be reviewed by the Northeast Chapter’s Board. Please contact George Aulisio (george.aulisio@scranton.edu) with any questions.